Successfully Added Dual Camera Car DVR - 480P, 3.5 Inch LCD Screen, 1/4 Inch CMOS Sensor, 140 Degree Lens, Motion Detection, Simultaneous Recording to your Shopping Cart. 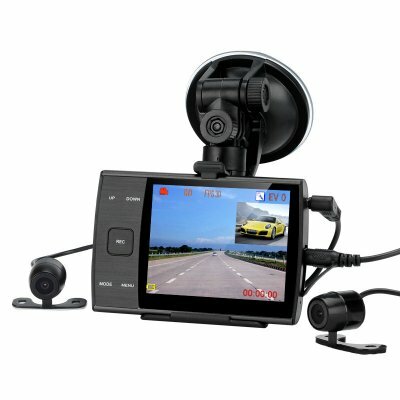 Make sure every road trip goes smoothly with the dual camera car DVR coming with 480P resolution, 1/4 inch CMOS sensor, 3.5 inch LCD monitor, 140 degree lens and more. Get first class protection on the road against fraudsters and make sure you have plenty of evidence in case of a traffic accident. No matter how sure you may in what happened on the road or what you have seen, solid proof is the only thing that matters. With the dual camera DVR, you will have that proof whenever needed. The dual camera DVR is a double threat to those trying to scam you on the road. Make full use of both cameras and install one at the front and one of the back.The DVR supports simultaneous recording with two cameras, or you can choose to record with either one at a time. You can even enable PIP so both camera views can be seen at once. With a 140 degree wide angle lens and 480P resolution at 30 frames per second, you can be sure to get great quality videos. The 1/4 inch CMOS sensor will be a guarantee of crisp and clear images. You can also review all the videos on a convenient and compact 3.5 inch LCD screen. Thanks to H.264 encoding, all the videos will be efficiently compressed and stored without taking up too much space. The Dual Camera Car DVR comes with a 12 months warranty, brought to you by the leader in electronic devices as well as wholesale dual camera DVRs..